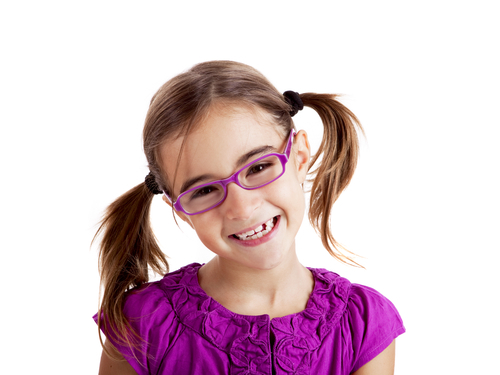 As All About Vision notes, the best place to start when choosing your kiddo’s frames is with the eyeglass prescription. If your child needs really strong lenses to correct a vision problem, it’s best to keep the frames on the small side; this will keep the lens thickness to a minimal size as well. Not all glasses will look the same on every kiddo. As Parenting notes, children with adorable round faces tend to look better in squarer frames, while tots with more angular features are complemented by round glasses. Also, try to steer clear of larger frames that can overwhelm the face. Here's a guide to determine glasses shape according to face shape, eye color and hair color. If your child is determined to get a certain type of frame and you are not pleased with the way it looks on his or her face, take a few deep breaths and ask your kiddo what is so appealing about the style. You might find that your son or daughter has chosen the unflattering style “because it’s blue” or “because it’s plastic and I don’t want metal.” If this is the case, ask the optician to bring out other styles that are also blue or made from plastic and encourage your little one to consider another option. If you are still butting heads, remember that the ultimate goal is for your child to wear the new glasses and to be able to see properly, so as long as the frames fit his or her face and are not too expensive, you might want to bend a bit. You’ve probably seen numerous kids pushing their glasses back on their noses over and over. This is typically due to a poor fit in the bridge area of the nose and frame. Here's an article about how to determine correct bridge measurement. Metal frames typically come with adjustable nose pads that can fit a child’s smaller nose and most plastic frames feature smaller bridges to stay put on a kiddo’s face. Once you and your son or daughter have several frame candidates on the table, evaluate each one to make sure it stays put on the nose. If it doesn’t, your child will end up peering over the top of the glasses, which will not help their vision at all. Eyeglass wearers of any age can lose, drop or otherwise destroy their glasses. It’s unfortunate, but it happens. To prepare for this scenario, consider buying a backup pair of specs for your child. You can either get a duplicate of the frames you are purchasing from your local optician, or you can select a pair online. For example, Ray-Ban features a terrific selection of stylish frames that are in smaller sizes for kids’ faces. They come in square, round, rectangular and other stylish shapes, and are high quality and comfortable to wear.